A former Tune of the Day for us, check out the updated video for Inner City’s ‘Future’ track. 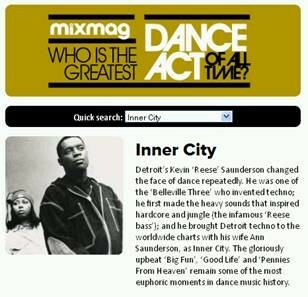 Led by Kevin Saunderson, his Inner City project is one of the most iconic acts in electronic dance music. Their late ‘80s records ‘Good Life’ and ‘Big Fun’ helped introduce Detroit techno to a worldwide audience, topping the domestic dance charts and also breaking into the UK overall top 10. They also served as a crucial bridge between techno, house and pop, offering a hybrid model that continues to inspire artists around the world, from the underground to the commercial FM dial. Now, for the first time in 15 years, Kevin Saunderson has reunited with Inner City’s Paris Grey and frequent contributor Ann Saunderson for the new single, ‘Future’.The video was shot at Air in Amsterdam and they will also be performing at Defected’s NYE event at Proud2 (O2).